The Pens have finally made their first signing from another team, giving RW Eric Godard a three year deal for an undisclosed amount (TSN). 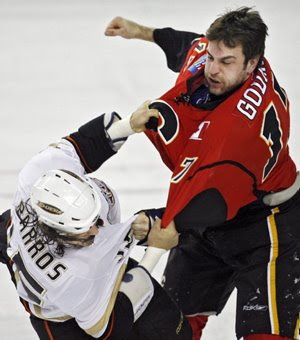 Godard, 6'4" 221, racked up an impressive 171 PIM, good for 11th in the league. The signing could signal the end of Laraque's run as the team enforcer. Definitely not as graceful as BGL, but probably $0.5-$1M cheaper.